Desperate for a power-hitting right fielder and feeling the sting of the defection of free-agent Jack Clark, the Cardinals stunned nearly everyone when they traded second baseman Tommy Herr, a stalwart of their three pennant-winning teams of the 1980s, to the defending World Series champion Twins in 1988. As he departed, Herr said he hoped to return to the Cardinals as their manager. It never happened. On April 22, 1988, Herr was dealt to Minnesota for outfielder Tom Brunansky. The trade was announced after the Mets beat St. Louis, 4-0, dropping the Cardinals’ record to 4-11. 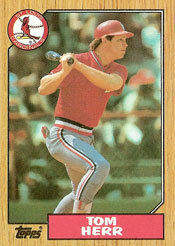 Herr played 10 seasons (1979-88) with the Cardinals, batting .274 with 1,021 hits in 1,029 games. He was the starting second baseman on the pennant-winning clubs of 1982, ’85 and ’87. He was an all-star in 1985 when he placed third in the National League in both RBI (110) and doubles (38). Herr ranked among the top three second basemen in the league in fielding percentage six times. “It’s not an easy thing trading a great ballplayer and a fine gentleman,” Maxvill said to the Associated Press. _ The Cardinals lacked power. Their top run producer, Clark, had signed with the Yankees after the 1987 season. Jim Lindeman, the Opening Day right fielder, was headed to the disabled list because of back spasms. The Cardinals were averaging 2.8 runs per game. Brunansky, who had hit 20 or more home runs in six consecutive seasons (1982-87) for the Twins, provided a much-needed power source. _ The Cardinals feared Herr would depart for free agency. Herr was in the final season of a four-year contract. After losing reliever Bruce Sutter and Clark to free agency, the Cardinals were determined to get value in return for Herr before he could depart. _ The Cardinals had a replacement for Herr. Luis Alicea, a first-round selection of the Cardinals in the 1986 draft, was promoted from Class AAA Louisville to replace Herr at second base. “We think we have a fine young man who is ready to be an everyday player here in Alicea,” Maxvill said to United Press International. Twins general manager Andy MacPhail told the Associated Press he contacted Maxvill about a trade. The Twins were seeking a left-handed batter for the top of their order. Herr, a switch-hitter, fit the need. MacPhail said Maxvill first asked about third baseman Gary Gaetti and outfielder Kirby Puckett. “I told him I wouldn’t trade Gaetti and that my house would be burned to the ground if I traded Puckett,” MacPhail said. The Twins had defeated the Cardinals in a seven-game World Series in October 1987. Six months later, they were swapping position starters. 2nd worst trade ever made by the Twins, next to the Santana debacle. Thanks for your comment. Twins didn’t get much from Herr _ just 86 games before he was traded to Phillies. Umm..Herr opened his mouth about unionism and caused labor trouble in the clubhouse. His gaffe on KMOX was the handwriting on the wall. Minnesota teams were all about bad trades during that time. Herr was bad enough, but the Vikings trade for Herschel Walker was not only a train wreck it was an embarrassment for the remainder of the 90’s. Thanks for the insights. I remember that time well.